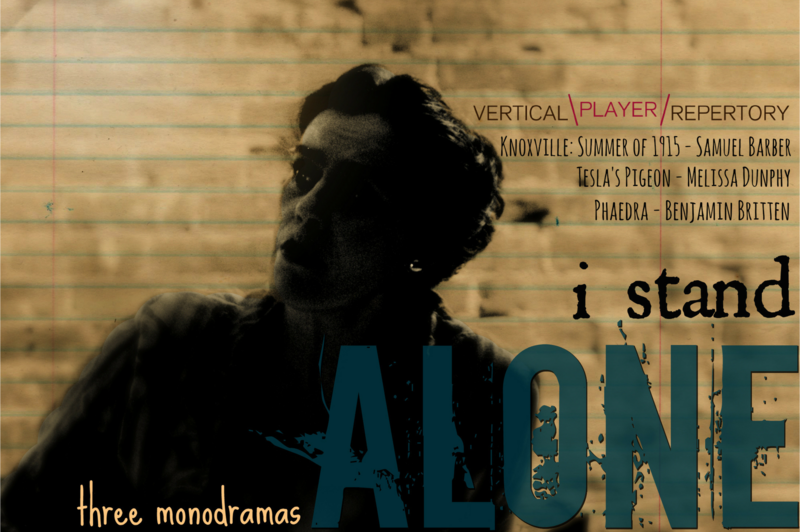 I Stand Alone brings together three powerful monodramas written for the female voice: Knoxville, Summer of 1915 by Samuel Barber, Tesla’s Pigeon by Melissa Dunphy, and Phaedra by Benjamin Britten, performed by three different singers. Each piece deals, in some way, with an impossibility, a yearning for something that can never be attained. Knoxville, Summer of 1915, James Agee’s poignant memory poem of a childhood seemingly untroubled, contains hints of the loss that is to come, with world war an unspoken presence looming on the edge of consciousness. Tesla’s Pigeon uses texts from The Tempest and Faust, among others, to depict the mystical, otherworldly romantic love of the reclusive genius Nikola Tesla for a white pigeon who came to his New York hotel window every day. Phaedra, based on a verse translation by Robert Lowell of Jean Racine’s 1677 play Phèdre, is a naked confession of a searing, soul destroying, forbidden love. The staging takes us from the calm embrace of a family gathered at dusk in Knoxville, a dusk suffused with a child’s unanswerable questions, through the turbulent night and dawn that Tesla and his pigeon share on her last day on earth, and lastly to a brilliant noon in Athens, brutal in its clarity and Phaedra’s arrival at a devastating self-knowledge.